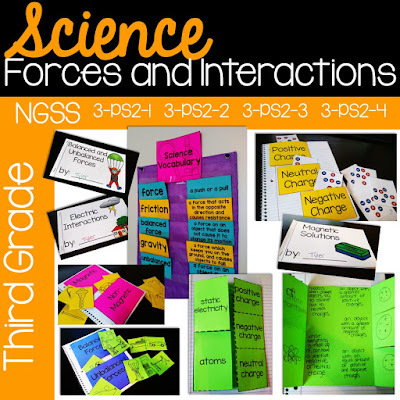 Scroll down to take a look at *some* of what is included in this 140 page third grade Forces & Interactions unit. This unit aligns to NGSS* standards 3-PS2-1, 3-PS2-2, 3-PS2-3 and 3-PS2-4. This topic focuses on understanding how every force is a push or a pull and is balanced or unbalanced. Students will also learn about gravity and Newton's Three Laws of Motion. This topic focuses on learning about different types of patterns in motion and how they can be used to predict future motion. This topic focuses on electric interactions and magnetic interactions. Students will learn how positive and negative charges interact. This topic focuses on magnetic solutions. Students will learn about various ways magnets are used to solve problems in our world, and will complete an investigation solving a problem with magnets. This was just a preview. For a FULL list of resources included in this 140 page Forces and Interactions unit, please see the Table of Contents or check out the 42 page preview by following the link to my TPT store.